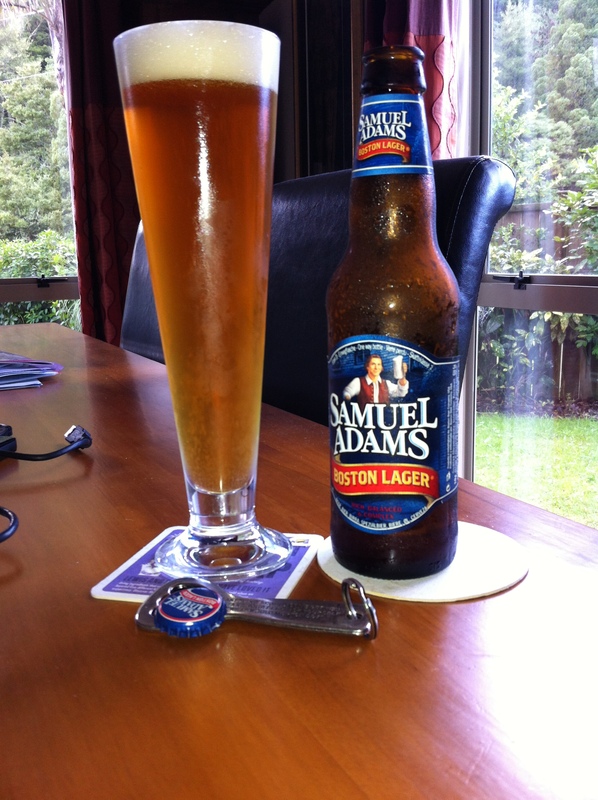 Samuel Adams Boston Lager. A gift which I failed to look in the mouth. But never let it be said that I’m a snob, and this is a beer you can readily buy and enjoy. So Boston Beer, Boston the Band, Sports numbers and Cheers at the party. This is one of 6 of the 335 ml bottle sized, that has beer of 4.7% ABV inside, giving it 144 calories a serve size, and 1.3 standard drink units in the bottle. Samuel Adams Boston Lager® is the best example of the fundamental characteristics of a great beer, offering a full, rich flavor that is both balanced and complex. It is brewed using a decoction mash, a time consuming, traditional four vessel brewing process discarded by many contemporary brewers. This process brings forth a rich sweetness from the malt that makes it well worth the effort. Samuel Adams Boston Lager® also uses only the finest of ingredients including two row barley, as well as German Noble aroma hops. The exclusive use of two row barley not only imparts a full, smooth body but also gives the beer a wide spectrum of malt flavor ranging from slightly sweet to caramel to slightly roasted. The Noble hops varieties, Hallertau Mittelfruh and Tettnang Tettnanger, add a wide range of floral, piney and citrus notes, which are present from the aroma, through the flavor, to the lingering smooth finish. We take great pride in the Noble hops used in our beers. They are hand selected by Jim Koch and our other brewers from the world’s oldest hops growing area. Among the world’s most expensive, they cost twenty times as much as other hops. What could possibly go wrong with that? Well Vienna Lager is of course the darker maltier version of lager, which if done well is a treat. On the other hand if it’s made with ‘the world’s most expensive hops’ how was this half the price of other beers? Dark malt aroma, quite intense, Pour is the most glorious bright burnt orange beer with a lovely head of firm foam that looks a right treat. Aroma in the glass is more malt beer than anything else, just dialled up a bit. Taste is hard to pin down on this, there is a lot of sweetness thorough this that somehow bring a sense of a full bodied beer. This is a very hearty and enjoyable beer. Enjoyable that it isn’t challenging and you can drink it without prejudice, foreboding, expectation or thinking too much about subtle hop combinations and brewers notes. A Couple of these in an afternoon wouldn’t be a bad way to waste a couple of hours if you had to. Sure there are better beers, there always are, always. I can imagine this being popular as offering a different take to a lager, and yet not be a bitter, sort of beer someone who wanted to show off just a little bit to a crowd of standard lager drinkers might drink. The pdubyah-o-meter rates this as 7 of its things from the thing. It really isn’t bad. It isn’t spectacular. Rates as well as the other Vienna Lager types I’ve had, and is a style that is probably not explored or enjoyed as much as it might be. Am I enjoying it? Yes, it’s surprisingly quote enjoyable. Would I have another ? I have a 6-pack so I will be enjoying another. Would I share with a friend on a porch and set the world to rights? I don’t know that this is an ‘everyman’ beer and ‘Lager’ would confuse many as it’s a style of lager that isn’t golden malt plain old lager, so I’d be careful about taking to some places. Musically, of course not Boston, nor Aerosmith,Pixies, The Cars, NKOTB, Boston Dolls, Mighty Mighty Bosstones, or Lemonheads, but I went with the DropKick Murphys. Sam Adams was the first microbrewer to make it big in the United States and it’s a shame. Their beers are very non-descript, lacking in any real character. Boston Lager is their bestseller and it’s the most non-descript of the bunch. It priced at under a US1 a bottle here, 12 of them for the equivalent of 10.54. I’m pretty sure I’m happy with a beer that costs a buck a go. Sometimes you have to go bulk over substance. Can’t disagree with that. And sometimes you have to go with a beer that’s easy to drink. 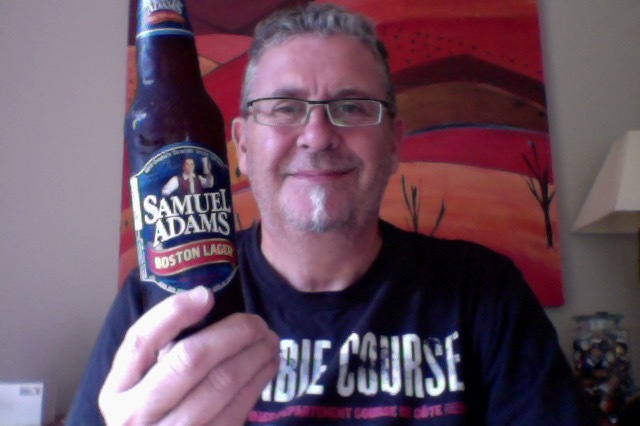 This entry was posted on April 27, 2015 by Philip Walter in Amber Lager/Vienna, Beer, Beer of the USA, Beer Review, Craft Beer, Critic, Samuel Adams and tagged Alcohol by volume, Beer, Boston Lager, craft beer, Dark Lager, Samuel Adams (beer), Samuel Adams Boston Lager, Vienna Lager.